Area code 709 was put into service. Area code 709 was created from a split of area code 506. 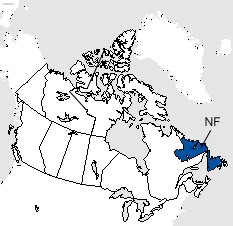 Area code 709 serves the entire province of Newfoundland and Labrador. Area code 879 has been approved as an all services overlay of area code 709 with an implementation date of 5/20/2022. Ten digit dialing (area code + seven digit number) will be necessary in the 709/879 overlay because different homes in the same geographic area can have the same seven digit phone number but each would have a different area code. Area code 709 serves the larger communities of Bay Roberts, Carbonear, Clarenville, Conception Bay South, Corner Brook, Gander, Grand Falls-Windsor, Labrador City, St. John's, Stephenville and Twillingate in addition to many smaller communities throughout Newfoundland and Labrador.